Though I'm sure an untrained eye cannot decipher meanings and from a design standpoint people will harp on about there not being any labeling I just thought it was a cool image and an example of accidental design. 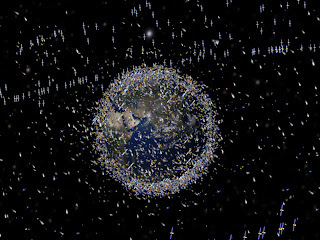 Ok and since I'm cool like that, here is another image: This is from NASA's site, it is an image of satellites and debris in the earth's orbit. 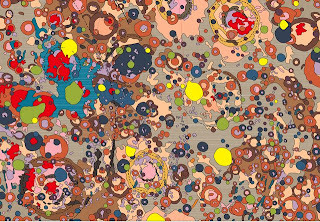 Here is the description given; "The debris objects shown in the images are an artist's impression based on actual density data. However, the debris objects are shown at an exaggerated size to make them visible at the scale shown." Wow. It's so interesting that those two images can be about the same thing, yet a have totally different artistic approach to it. Great find. Interesting design featuring the dark side of the moon(this reminds me of Pink Floyd's historic album). I guess you can regard this as accidental design but there is more to this design. The vast array of circles and shapes to the toned down color palette creates a kind of unified and controlled design work. This design would almost belong in a museum or in a type of sophisticated setting. These circles and shapes can have no real reference or relationship to anything in this world but from the designer's perspective they do stand for something. The other design featuring a data chart of space junk surrounding our planet is featured in our Art 468 textbook titled Envisioning Information by Tufte. The version in our textbook which is in black and white is informative but with color this chart stands out visually and creates an unique depth and scale that is not featured in our textbook.